Many organizations are choosing Red Hat® Enterprise Linux® for datacenter modernization initiatives. Since Red Hat Enterprise Linux is used in heterogeneous environments, it can be deployed in a manner that protects and extends previous Windows infrastructure investments. 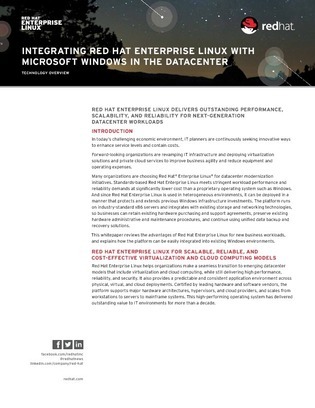 This whitepaper reviews the advantages of Red Hat Enterprise Linux for new business workloads, and explains how the platform can be easily integrated into existing Windows environments. Read on to learn more.